The seemingly deathless triple threat of the U.S./China trade dispute, fear over surging U.S. crude production, and waning global demand for oil, caused crude prices to take a 2 percent dive on Thursday, with near-term trading turmoil virtually assured on word that Russia is unable to cut its output as quickly as hoped and the normally upbeat Organization of the Petroleum Exporting Countries (OPEC) warning that a new cutback deal with partners may be necessary to avoid a global glut. 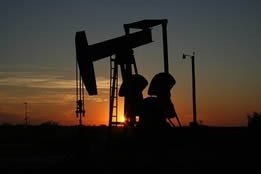 Brent fell $1.06, or 1.7 percent, to $60.26 per barrel on Thursday, while West Texas Intermediate dropped by $1.00 to $51.31 per barrel, off 1.9 percent. Analysts attempted to downplay yet another trading day of losses, with Thomas Saal, senior vice president of INTL Hencorp Futures, pointing out that while the Americans pumping all out is "going to weigh on the market at least until we get some new information," investors had already expected increasing U.S. production and priced it into the market, "so that's why prices are down a little bit and not down a lot." Saal's take on the market is not unreasonable, given that crude is still about 20 percent above the lows reached in late December, and Harry Tchilingurian, head of commodities for BNP Parabas, said that if Brent can move past $62 per barrel, "From there, the door will be open to target $70, [if] we do not have negative news emerging around U.S.-China trade talks that caused high levels of angst and de-risking last December." But such an increase would depend at least in part on the ability of OPEC and its allies to keep global output at a reasonable level, and unfortunately on Thursday Alexander Novak, energy minister for Russia, issued an alarming signal by telling media that "Russia, as a matter of principle, cannot sharply decrease oil production but we will try to do it faster." The former Soviet Union had pledged to aid OPEC by curbing its output by 228,000 barrels per day (bpd) starting this month, but Novak said his country well start slowly, by cutting a paltry 50,000 bpd in January, citing technological circumstances that limit anything bigger. Meanwhile, Mohammad Barkindo, secretary general for OPEC, told Reuters on Thursday that his cartel is seeking to avoid a build-up in oil inventories through a new deal with non-OPEC partners to curb supply in 2019. He added, "We are not yet out of the winter woods: the principal objective is to voluntarily assist the oil markets to remain in balance through 2019 by ensuring that we avoid an inventory build up above the five-year industry average." However, even if these elements conspire to cause further turmoil in crude trading, it remains true that some traders' fears are music to the ears of others, ie: U.S. president Donald Trump is a strong advocate of lower prices because it means a break for American motorists at the pump, and they're also beneficial to emerging economies such as that of India. Additionally, the perceived threat of the U.S. pumping all-out also means that the Americans are edging ever-closer to their long-awaited goal of energy independence, and on that note the Energy Information Administration said in in its latest forecast that by 2020 the nation will start exporting more crude oil and fuel than it imports. The administration forecast that net imports will dwindle to 1.1 million bpd next year and just 100,000 bpd in 2020; in the final three months of 2020, the EIA calculates the U.S. will become a net exporter by about 900,000 bpd.